AEAI co-founded and financially (and with technical staff) supported a Brazilian NGO (BRASUS) with one Brazilian firm and three (non-financial) participating organizations to promote integrated sustainable development initiatives, specializing in renewable and rural energy projects and market promotion, business models for clean energy projects, CDM and carbon financing, innovative financing for RE projects, local organizational support and institutional capacity building. The NGO successfully developed and implemented a unique Regional Market Manager model and methodology, multidisciplinary market study methodology, and Revolving Fund for financing rural renewable energy projects. BRASUS financed 48 projects utilizing renewable energy technologies for productive uses. It trained more than 1700 Brazilian stakeholders on a range of topics, from RE technologies, productive uses of RE (e.g., for irrigation systems, chicken farming, handicrafts commercialization), and Climate Change to market study methodologies, market assessments, financial evaluation of projects, business planning, and organizational and administrative processes. Project sponsors included: the United Nations Foundation, UNDP, InWEnt (Germany), the State Government and six municipalities of Mato Grosso, the Municipality of Esperantina in Piaui State, IDB, TenDelNet (UK), Ministry of Environment/FNMA, IPCC, and E+Co. 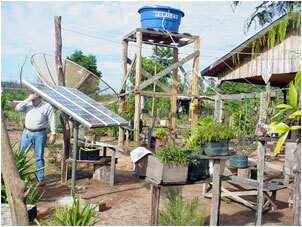 BRASUS Renewable Energy Projects (Brazil): As seen below, solar photovoltaic (PV) systems were used support water pumping, lighting, electric fencing, refrigeration and other applications to increase productivity for rural populations.